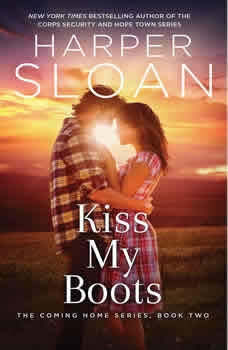 In this second of the sultry, Western-set Coming Home series from New York Times bestselling author Harper Sloan, Quinn Davis might finally have a shot at her own happily-ever-after—but will she let love in, or will she tell it to go ahead and kiss her boots?Quinn Davis prefers to live her life quietly. She’s the stereotypical tomboy with two overprotective big brothers who have always been there to protect her, especially from devilishly handsome cowboys with silver tongues. That is, until Tate Montgomery comes riding into town. Their first meeting, however, is far from something out of a fairy tale and only further convinces Quinn that men aren’t worth her time. The only place Tate Montgomery ever truly felt at home growing up was during the long, sweltering summer months he spent at his Gram and Paw’s farm in Pine Oak, Texas. Now, Tate has returned to his childhood sanctuary seeking a fresh start—but if he’s being entirely honest, he’s not just back for the wranglers and Stetsons. During those summers, Quinn was a friend-turned-young-love who Tate lost when life threw him a curveball and he cut all ties to his past; but all it takes is one glance at the raven-haired beauty he did his best to forget for him to realize just how much he’s been missing….